FOLLOWING on from Korea 101 and ESL: The Job, I received some questions about living and working in Korea, and I’m going to go through them here! If, after this post, you have more questions you’d like answered, please don’t hesitate to send them my way! Please do remember that the arrival process has changed a little since I first came to Korea, and I didn’t come through EPIK. I will do my best to bridge gaps where I can, but this is in no way a one-stop shop. I can already sense this is going to be another mammoth info-dump of a post, so let’s get stuck right in! FOR the most part, coming to Korea, your accommodation is provided. That’s one less piece of admin for you to worry about! But that leaves you with a bank account, a phone plan, WiFi, and bills to deal with. It’s worth noting that, technically, it is one of your co-teachers duties to help you with the admin side of things. If they’re not forthcoming in this department, polite requests for help are the way to go! My CT picked me up from the office of education on my first full day in Korea, and from there it was a busy day heading to the apartment, school, hospital, bank, phone company, immigration office, supermarket, and home again. There was no training period for me, but as I started on a Friday, and in August, the school was on vacation, so I had a month of desk warming to get used to everything, which suited me just fine! My hot tip for admin: Have a good 4-5 passport photos in hand when you touch down!! It makes life a lot easier! I gather that if you are with EPIK, that you do your medical with them, and everything else once your training period is over. I did my medical my first day, with my CT. We pay for this. Mine has always, generally, been around the ₩70,000 mark. Earmark a good ₩100,000-120,000 just in case. The medical entails a height and weight measurements, a hearing test, a quick chat with a doctor, blood and urine tests and a chest x-ray. The hospitals who do these tests are very practiced at it, and you won’t have any trouble. If your CT isn’t with you, you’ll be steered in the right direction. You will need at least 2 copies. Request these at the beginning! When I opened my account, first full day in Korea, I wasn’t 100% with it. I was jet-lagged and trying to rapidly get my bearings. I arrived at the end of the first semester, school was already out, and I was thrown straight into work – no training or anything for me! But that’s not the point of this section. Banking. My CT whisked me off to the bank, and we opened an account using my passport and her phone number. Doing it this way means you will need to return to the bank as soon as you have your ARC (Alien Registration Card) and phone number to update your details, which I also did with my CT. I was a painless experience as my CT was with me. That’s about as much as I recall! I can’t help much with this. My CT and I went after we’d open my bank account, I don’t remember if I as able to get a contract this day, or if I had to wait for my ARC. The other thing we did there was organise my home internet. This we were able to do that day, as my CT had just moved in with her new husband, and still had her old internet, with one month left on her contract. She very kindly transferred it over to me so that I had internet within days. When I moved to a new apartment, I was fortunate that the internet and TV came with the apartment. It all depends on where you live! Your CT will be able to fill you in on the finer points! As I will be leaving Korea for a wee while, and hopefully returning next year, I’ll be doing this all over again. I will be getting a rental SIM at the airport, because there’s no way I’m going without data. Most people use Kakao here – I’ve met anyone, personally, who doesn’t – and calls can be made through Kakao as well, so there’s no great need for calls and texts, and on the pre-paid data SIM, your incoming calls and texts are free! In addition to the ease of communication, you’ll also have a wealth of apps at your finger tips! As for your full on contract… there are all sorts of options, you know how you use your phone best! I would, personally, argue that being able to communicate, and use maps and apps, in your first few weeks in Korea is invaluable. It’s worth the money, if you have it! If not, there’s WiFi in so many place in Korea, that you’ll be able to find somewhere to connect! I gather in Seoul, you now have to book an appointment at the immigration office. Down here in Changwon, we can drop in, but if you need to make an appointment, this is the site you can use: HiKorea. Please bear in mind that this site, and many others in Korea, only work on internet explorer! You have to register for an ARC within 90 days, and it’s a pain free process so long as you’ve got all the relevant documents in hand, and cash. Your first visa is ₩30,000 and renewal is ₩60,000. It takes about 3-5 weeks to process your card. This is the list from Korvia. I believe you also need a copy of your employment contract. As for the school and accommodation documents – your CT will provide you with those. I’ve never seen them myself, as my CT’s have all been absolute heroes. For renewal, you will be sent a letter but the immigration office letting you know what you need! Much like your home internet, how your bills are organised depends on where you live. My first year, I was in an office-tell. In this instance, I paid the building supervisor every month. A slip would be left in my door telling me the amount due, and I took him the cash! In my second apartment, my bills were set up to come out of my account automatically. This is an option, it can be done, and it’s so convenient. Get your CT to help you, it’s worth it! NOTE: Once all the admin is done, and once you have your ARC card in hand, you won’t need to carry your passport around. Keep it in a safe place at home! THE first few weeks in Korea will be something else. Getting used to the lay of the land, making friends, getting used to the job, travelling, eating, and making your house a home. As for how to budget, you won’t know this till you get here and see what state your apartment is in. Only then can you work out what you can do with the money you have. I would recommend siphoning off what you know you will need for official documents, tests and your phone before even beginning to address anything else. This is entirely dependent on your situation. Let’s kick off with the basics: Food and transport. How often will you need to take a bus to work in the first few weeks? Every day, or once or twice a week. Set money aside for your travel card accordingly (see Korea 101 for more on travel cards.) After that money has been earmarked, you can tack on what you think you might need for travelling around your local area. I would recommend staying on home turf till your first paycheck lands, of course this also depends on you and your available budget! Find your nearest supermarket, local or otherwise, and go and take a gander. Walk around, see what’s avaliable. If your phone is data’d up, you can use google translate to uncover the mysteries of certain ingredients or what not! Scope out the general prices of things, and see what you may like. Make a shopping list. If you’re brave enough, have a go at the local markets – fruit and veg will be cheaper there! 1. Eat Korean. It’s cheaper. Kimbap is cheap as chips, it’s delicious, and there are a million and one kimbap places wherever you go. Kimbap Nara (김밥나라) is a chain, or sorts, of “fast” korean food. Kimbap, fried rice, and soups for hella cheap. To be honest, I like eating at these places out of choice, and you can even get it to take away! 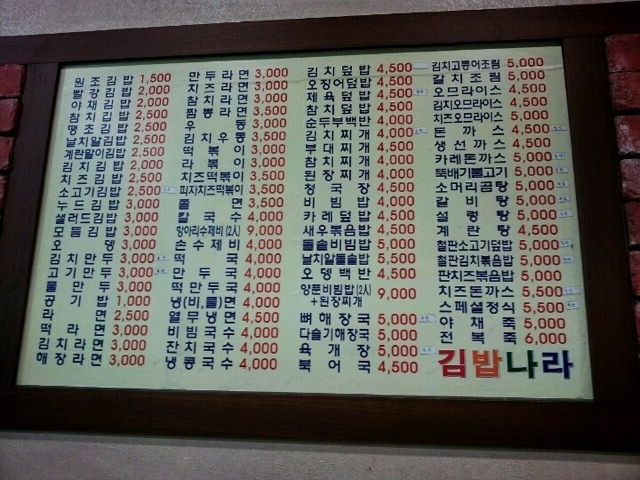 You’re looking at prices ranging from ₩1,500 to ₩6,000. 2. Learn to share. Going for pizza? Get one pizza and one pasta dish between 2-3 of you! It’s become habit to do this now. It’s common, in Korea, to have your food in the middle of the table, and everyone digs into the same thing. It depends on the dish at hand of course! 3. Cook with friends! First off, it’s great way to get to know people, it’s cheaper for all involved, and it’s way more chill! Food is a great leveller, and cooking in means you can share ingredient costs, which in turn means you can potentially splash on something a little more avaunt guard… like cheese. I kid you not, the struggle can be real! Whatever means you use, there is cheap food out there, and you won’t go hungry! I mention these apps, and more in the first Korea 101 post. That information still stands. Buses are your friends. Get to know the bus routes to your favourite places. You’ll learn the timetables eventually, learn which route and numbers are the emptiest, and what times are the most comfortable to travel – if you have the option of choice. Living in Changwon City, the buses are how we travel between the three parts of the trifecta, and the bus network is awesome. On the odd occasion you have to transfer buses, you can follow the Kakao bus app to work out the best stop to transfer at – I do this as early as possible in routes to give myself a greater chance of a seat – and it’s the best feeling ever when you can walk straight off one bus and onto another! Magic! Take the time, in your first few weeks, to walk around you local area, get a feel for the place. See what stores, cafes and restaurants are about. Get on a random bus and see where it takes you. Buses are regular, and the route is generally the same in both directions. It’s definitely worth taking the time to explore. I’m actually leaving Korea, temporarily, for London, and I’m nervous about it. I’m nervous because in comparison, Korea is so much safer. That doesn’t mean you can be complacent, but I have never felt uncomfortable or threatened in Korea. That’s not to say things don’t happen. The best advice I’ve seen is that, if you feel you are being followed, head for the nearest convenience store. Staff are apparently trained to call the police in such situations. I hope you don’t have to resort to this, but know that this option is there. You’ll get a feel for your area, for how late you feel you can wander around etc. Overall, Korea is much safer, buses generally run till about 11pm, and taxi’s are reasonably priced. I was at a friends house for dinner one day, and I was super tired. I decided to get the last bus home instead of springing for a taxi, possible because my friends new home was right at the start of the bus line. I don’t have to pay too much attention on the bus, because my stop is the first one after the tunnel, and you can’t miss the orange lights of the tunnel. Only I did. I completely zoned out, and when I finally realised I wasn’t familiar with the scenery outside, I was already out of my town and headed towards Busan. I got off at the next stop and found myself in one of the village areas between Jinhae and Busan. It was nearing midnight, and the buses had just stopped running. I didn’t bat an eyelid. I crossed the road, opened my Kakao Taxi app, plummed in the location of the bus stop and my home address, and called a taxi with the press of a button. One was there within seconds, and I was home not long after midnight. The moral of the story is, I didn’t feel worried or unsafe the entire time. And this is why data on your phone is invaluable! The Kakao Taxi app bypasses the language barrier as you don’t need to actually speak to anyone to call a taxi. I was asked how you deal with language barriers if you arrive with little-to-no Korean. I arrived being able to read Hangul and say a few rudimentary greetings, and that was it. My CT’s all spoke English, to varying levels, but it was simple enough to communicate. Outwith school, I have found that communication will always make itself possible, regardless of language knowledge. There’s a fair amount of Konglish running through Korean, making simple things easier to communicate. I have also found Koreans keen to use English when they can. At the supermarkets, before I grasped what the word for ‘bag’ was, saying “bag 주세요.” worked just fine. To ask for a bag in the supermarket, or in store, “봉투 주세요” will do just fine. They’ll ask you in Korean. Listen for “봉투”, say yes, and you’re good to go! The easiest way to help yourself is to learn your please’s and thank you’s ASAP. A little goes a long way, and even if you falter after an initial greeting, being able to say you’re sorry, you don’t speak Korean, show’s you’re at least making some effort, and effort is always appreciated. And smile. Always smile. I said this in ESL: The Job, and it’s just as true outside of work as it is in work. I would also recommend you ditch romanizations. They won’t help you any more than phonetic Korean translations help students learn English – Newsflash: They don’t. The two alphabets do not make compatible sounds, so let it go. Whilst I go in-depth about teaching in ESL|The Job, I’ll add a little more here. I would assume that, unlike me, you will have had some training before you actually step foot in a school. I would also hope that your CT, or your colleagues, are good-uns. It’ll take a wee while to get used to the layout of your school, but generally the layout of schools is much the same – you can spot a school a mile off as they all seem to be built from the same architectural blueprint. You have your offices and cafeteria on the ground/first floor (and maybe a classroom of two depending on the size of the school) and then it’s just a question of knowing which grades are on which floor! Simples. Get your timetable down, speak to your CT about what role they’d like you to take in the class. Ask for their advice, their input. You need to gauge your CT, and sometimes manage them, but at all times, remember we are the guests and regardless of the rule book, they have the upper hand. And always be polite. With regards to your first lesson, I would prepare an introductory PPT. Have photos of you, your family, your hometown, facts about you or your home country. Make it into a wee quiz, allow a Q&A section – the students love asking questions. Discuss classroom rules with your CT and tack these onto the PPT if needed. Decide on a reward system early-on: candy, stickers etc. Obviously, it’s a good idea to keep this in line with what your CT does, or would like to do. Much of the above depends on your CT’s, how many you have, and how often you teach with them. Do not be afraid of teaching alone should this be asked of you – with the textbook, KorShare (mentioned in the Job post) and a handful of games up your sleeve, you’ll quickly get into the swing of things. Culture shock is an inevitability. Whilst it might not always manifest itself in the same way in each individual, it is always there. I haven’t been hugely affected by culture shock. I first came to Asia six years ago, and spent just over two years in Hong Kong before moving to Korea. That meant I spent two years living in a country that gave me a taste of Asia whilst being totally foreigner friendly. Hong Kong is an easy place to live. If anything though, Korea has been more comfortable as I can actually read Hangul! Easy as I found it, we all still have our wobbles and there are days when you miss home, or when a cultural difference gets to you no matter how prepared or used to it you are, so what can you bring from home to make the transition more comfortable? It’s always nice to have things about your apartment that remind you of home. I was given three hanging strings of photos from my co-workers when I left Hong Kong, and I still have them up in my apartment. I also spent two weeks in the UK between Hong Kong and Korea, so when I came to Korea I had, in my suitcase, an ornament from my cousins wedding, a drifwood, a proper wool blanket (so good for winter) and a couple of mugs. Sure you can find these in Korea, no problem. Kind of. They are available, but the options are limited – more so outside of Seoul. For Tea, the main imports are Twinings and Lipton. For Coffee, Illy and Lavatza – and not in all supermarkets. If you’re a coffee drinker, these are worth springing for. Korean instant coffee isn’t too bad, but their ground coffee’s really aren’t up to par. If you have a favourite from home, pack some to tide you over while you find what you like. I’m partial to a couple of the Taylors of Harrogate blends of tea and coffee, and stock up when home, or my fabulous friends sends me some excitement. I also stocked up on some of my favourite Hong Kong tea’s last time I was there! If you are a baker, and plan on buying an oven, bring spices. They’re not always easy to find here. The two most elusive are mixed spice (NOT allspice… Mixed spice is the cinnamon/ginger/nutmeg magic) and pumpkin pie spice! A candle that smells of home might be just the thing you need on a bad day! Of course there are candles aplenty here, but sometimes there’s that one smell that’s so distinctive it can’t be recreated or replaced. If you happen to be someone who has one… I’ve had Rupert since I was three years old, and I have him with me in Korea. I left him behind when I was in Hong Kong, and it just wasn’t right! If you’re a TV/Movie person, a stocked up hard drive will be invaluable those first few weeks. You can’t guarantee you’ll have immediate internet access, so it’s worth investing in a hard drive with watching material so that you have something to occupy your time if needs be. Getting sick happens to the best of us, and it’s not fun for anyone, but there’s something about getting sick when you’re away from home that makes it feel ten times worse. And then there’s the fact that taking sick days is a little like pulling teeth – you have to be reeeeeeally sick to get that day off. In four years I can count my sick days on the fingers of one hand. And I’ve been sick! The winter of 2016/17 I ended up getting the full blown flu – it hit on Christmas Day! boxing day, I was full on fevering. I took that one day off, and was back in for the rest of the week. School was out and I was desk warming, thankfully, so I was able to nap, but Flu Fatigue is no joke, and come Friday I was in a bad way. Knowing my body as I do, I just needed to ride it out (and this is coming from an asthmatic) and after a couple more weeks of taking it slow and looking after myself, I was fit as a fiddle. That was the year the flu virus was beating the flu jab – the same as what’s been happening elsewhere in the world the winter just gone (’17/’18). I didn’t actually go to the doctor, more because by the time I was able to drag myself there, I was getting better! They’ll put you on a drip. This is so normal it’s like breathing. They’ll stick it in your arm, pump you full of the good stuff, and away you go. I’ve never had one myself. I can’t take ibuprofen, NyQuil, nor do I trust anything outside of paracetamol (again, the asthmatic thing) so I’ve never quite been comfortable with the bag of wonder drugs, but my friends who have had it say only good things! You’ll get this super awesome string of pills. Honestly, I love how they do this. They put all the pills you need for each dose in it’s own little packet, so you have everything you need right there, and they generally give you three days worth. All the doctors I have seen have been awesome. Not always a great amount of English, and when I busted my ankle a year ago and had to go to A&E on a Sunday, there was zero English from the doctor or nurses, but with my terribly broken Korean, my hero of a friend and a few words from the doctor and nurses, we got through it all OK! “아파요!” and pointing to where it hurts will get you far when needed! As for your everyday sniffles, get those masks out and carry on. The masks are awful to wear when you’re not used to them, but now I’m on board with them as, more than anything, they’re a great big beacon to the kids that say: “I’m sick, behave!” and they do! My little tip to you, is in winter if you get struck down by a lurgy and you happen to walk by a convenience store on your way to work: honey yuja tea. the keep bottles of this in the warming cabinet, and it’s hot, delicious and so wonderfully soothing. It was my first year in Korea, my first winter, and I was sick. I’d taken a day off, and was going into work. There was a 7-11 right next to my building, so I popped in to grab some tylenol and some tissues. I must have been looking rough because the ajussi took one look at me, went over to the hot drinks cabinet, and got me a honey yuja tea, and didn’t charge me for it. I was feeling so rough and so miserable that this one small action turned my day around. You hear all sorts of stories about Koreans and ajussi’s, the internet is full of them, but this one man proves that you only ever hear the negative, because people don’t often shout about the positive. Well, this ajussi is a legend! There’s not getting around this one. They come round like clockwork (generally) and it’s hard enough to deal with them as it is, never mind when you’re in foreign lands. Some things to note about periods in Korea. Tampons aren’t that popular. You can find them, sometimes, but the options are very limited, almost non-existent. I’m not a tampon fan, myself, so I can’t tell you much more than that. Pads… Korea has so many… so many. Kind of spoiled for choice! Mooncups/diva cups etc can’t be found here – you have to order from overseas, so if this is your jam, and you don’t have one, purchase before you get here. They’re well worth it, overall. I have a love/hate relationship with mine. Some months it’s the best thing since sliced bread, and others, it’s just not enough… light periods… what are those like? I still need to have pads on hand. Whatever works for you, have a couple of months of your faves on hand to tide you over whilst you scope out Korea’s options and work out what might work for you! I hope this post has been in some way helpful. For more posts on Korea, check out the Korea Tag. If you have any more questions, comment below, and I’ll be happy to answer them there, or even write another post!